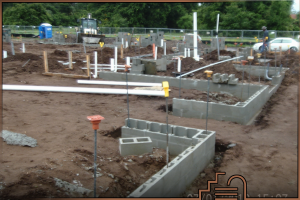 This week we highlight a new “net-zero energy” building that is going up in Riverview, Florida. A “net-zero building” is one that uses no external energy overall throughout the entire year. It may consume energy such as electricity from the utility company at times, but it produces electricity at other times. The result: net-zero energy use. It is one of the many exciting frontiers of sustainability. Why? Because traditional buildings use about 40% of all fossil-fuel energy in the U.S. Net-zero buildings – both residential and commercial – can make a huge dent in reducing energy demand, lowering greenhouse gas emissions, and combating climate change. 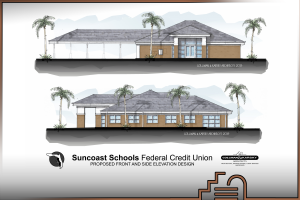 Collman & Karsky Architects of Tampa have designed a new net-zero office for the Suncoast Schools Federal Credit Union. a roof-mounted 40 kilowatt photovoltaic solar panel system. The system monitors both solar usage and the solar energy being sold back to Tampa Electric. This building represents Collman & Karsky Architects’ continued commitment to green initiatives that began over 10 years ago. It is the firm’s first net-zero design. The building construction began in July 2013 and is expected to finish in October 2013. I hope they give tours!